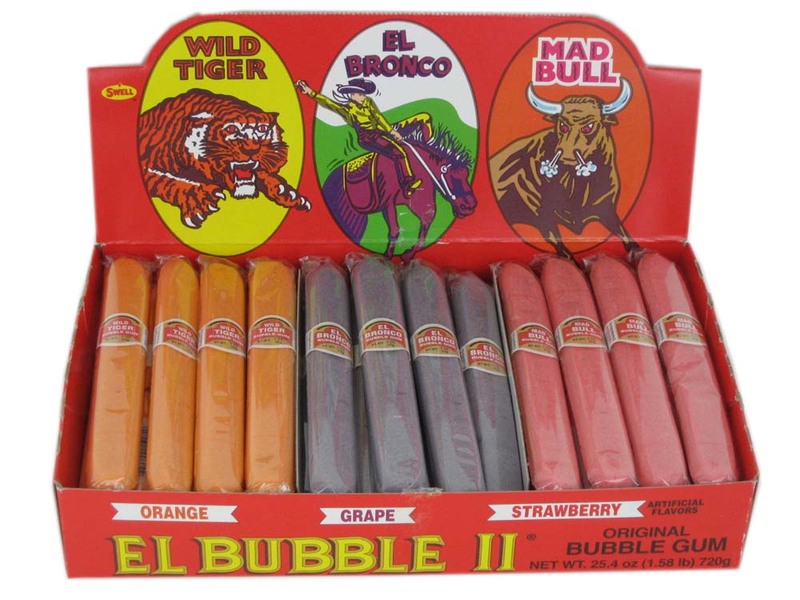 Bubble Gum Cigars were a favorite candy of mine when I was a kid; I would buy them for a nickel in the early '60s at the What Not Shop. The best thing about them was that they would last a few days. I would just bite a piece off and shove the rest back in the cellophane wrapper. Except for the bright colors, they resembled a real cigar pretty well. The shape was exactly like a real one. They even came with a cigar band; I would slide it off the cigar and wear it on my finger. Today Swell makes them in banana, fruit, mint, apple, orange, strawberry, and grape. They have your a baby. 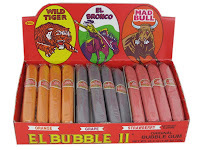 Bubble Gum Cigars were first made in 1949, and were the first 5 cent bubble gum. This is another nostalgic candy that has been appealing to each generation, and will probably outlive us all.